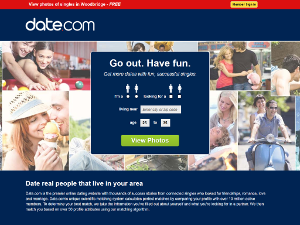 Date.com calls itself "the new way to date," and DatingSitesReviews.com users seem to agree: in 2007, the site was voted their top pick in the "Innovative" category. Date.com offers a handy toolbar that gives users instant access to the site, no matter what they're doing online, as well as a mobile feature and an online magazine with helpful dating advice. To find out what this service provides you can check out our complete list of Date.com features. Even though we waiting more than a few weeks before posting the original story about Date.com and Matchmaker.com disappearing along with the website for their parent company Avalanche, it looks things migh be turning around for the company, at least partly anyways. Matchmaker.com, Amor.com, GayDating.com, and Gk2Gk.com are all accessible again (confirmed last week from one of our visitors who commented on the original story). 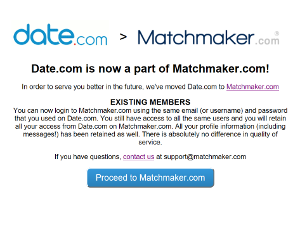 Date.com though now redirects to Matchmaker. A message on Date.com explains that it has become part of Matchmaker and all existing members have been moved over, including all of their profile information and messages. I was a little surprised of this since I thought the Date.com brand was stronger than the Matchmaker brand (though the Matchmaker brand is older). Avalanche's corporate website (avalanchellc.com) is still down and all of their affiliate programs (at CJ, Flexoffers, etc.) have had their campaign paused. I am not sure what is going on at Avalanche where their websites disappeared for around 2 months. Maybe they had financial issues or the websites have been sold? I am not sure but when we know more, we will let you know. We currently have all Avalanche dating sites listed as closed. Once we get a bit more information and see if things have stabilized we will update the reviews. I am sad to say it looks like Avalanche LCC has gone out of business. Date.com is one of their premier dating services which we last visited on October 6th and was confirmed still up and operating on October 7th, 2016 by the Internet Archive. It seems a week or so later when the dating site was again visited an error was reported indicating the dating service was down. When you visit Date.com now your browser will receive an "Error 522 Connection timed out" from CloudFlare. In fact all of Avalanche's websites including Matchmaker, Amor, and Gay Dating are now unreachable, including Avalanche's own corporate website. I sent a few emails out to see what was going on this week and they bounced back undelivered. With all of this evidence and with over a week of their web sites being down I think it safe to assume that unfortunately Avalanche and the dating services they own have gone out of business. Avalanche ran over 20 dating services which we had reviews up for 4 of the more popular ones. This includes some of the oldest ones on the internet like Date.com which was started in 1997 and MatchMaker, which could be the oldest computer dating service since it was first started as a bulletin board system in 1986 (and in 1996 became a website). Other dating services we reviewed included Amor and GayDating.com. In this every changing landscape of online dating, dating apps like Tinder now rule the single's love life. If you don't keep your business current and in the media it is hard to survive for long online. We wish those who worked at Avalanche all the best in their new endeavors. I visited Date.com this morning and notice one major change right away. They now allow you to login to their dating site using one of 12 different 3rd party accounts you may have. This means it will be easier for new members to create a profile, as information may get pulled from these 3rd party accounts. 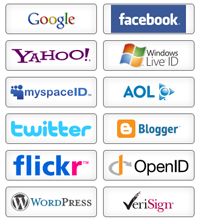 Some of the accounts you can now associate with your Date.com account includes Google, Facebook, MySpace, Twitter, AOL, OpenID and Windows Live ID. What I was hoping to see, but I didn't, was more integration with some of the Social Networks. It would be nice to see the friends of some of these Date.com members on Social Networks, endorse their single friend. I also came across Date.com's parent companies (Avalanche, LCC) website, I hadn't found it before this, since no direct link was available on their dating sites. You can find Avalanche's website here. The only dating sites that I can think of right now that allows members to log into of their dating site with a 3rd party account, is Match.com and Zoosk. Though, Match.com only allows Windows Live ID accounts. To find out more about this dating site, read our review of Date.com. Members purchase tokens that can be converted immediately, or at a later date, into Virtual Gifts. Online gifts, which range in price and start at $1, run the gamut from romantic to flirty. Everything from roses, hearts, Cupids and boxes of chocolates to martini glasses, food, stuffed animals, and even a shiny red sports car are available for purchase. Specialty items and limited edition items will be introduced in future updates of the feature. Branded Virtual Gifts will also be available to advertisers that are looking for innovative ways to market products to online daters. Singles do not have to be paying subscribers of the sites to purchase, send or to receive Virtual Gifts. Virtual Gifts can be purchased using all major credit cards as well as via PayPal. Virtual Gifts are currently very popular on social networking sites. The industry is estimated to be worth $1.5 billion in 2008.